Do you need some Son-shine? Last week I was given a beautiful potted plant of Narcissus flowers surrounding a beautiful Amaryllis. It looked gorgeous on my coffee table. But in just a few days the flowers started bending over, rather than standing up straight and tall. 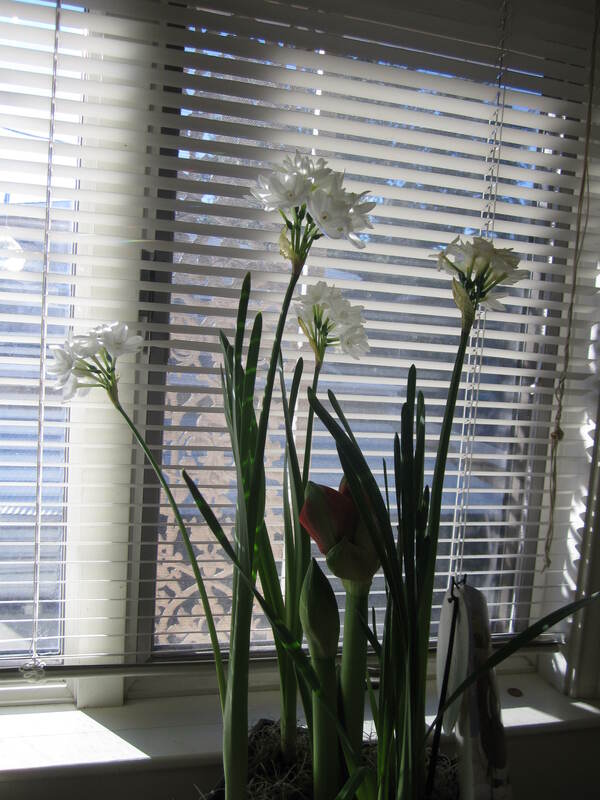 Yesterday I put the drooping flowers by the window, where filtered sun light flooded the room. This morning, the flowers greeted me as if they were standing at attention! They are gorgeous! Living things always gravitate towards the sun. You and I are “living things” too, designed to gravitate towards the Son, the Son of God. But are you in His Light each day? If you are feeling bent over from the burdens of life, place yourself in the light of Jesus, through time spent in His Word. You’ll be straight and beautiful, just like you were designed to do, before you know it!